Car dealers sell dreams. 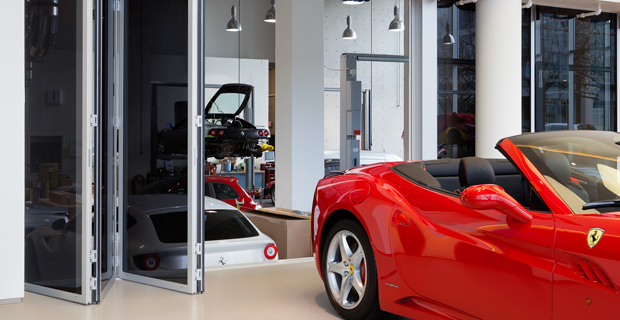 A NanaWall operable glass wall removes the physical and psychological barriers between clients and dream vehicles. NanaWall systems gives you the option for wide-open space to seamlessly transition the display lot and showroom floor when open or secure energy efficient weather protection when closed. A NanaWall system installed as a service entrance or in the delivery room allows for easy inventory rotation or an unforgettable drive-off experience for the new car owner. Car dealerships don't just sell vehicles, they sell dreams. When customers walk onto the showroom floor, they're thinking about the feeling of wind in their hair and the sound of a purring engine. To be boxed into a poorly lit showroom is like displaying a work of art in a dim room. Nanawall exterior glass wall systems create an environment that is worthy of the car shopping experience. The auto showroom floor is where car buyers go to explore the latest models and picture themselves on the open road in their new set of wheels. Glass walls that welcome in the natural sunlight can help customers picture that scene a little more clearly. Plus, oversized sliding glass doors make inventory rotation easy. Simply unlock and open the door, then drive on through. Best of all, NanaWall exterior glass walls are secure, energy efficient and offer amazing weather protection. 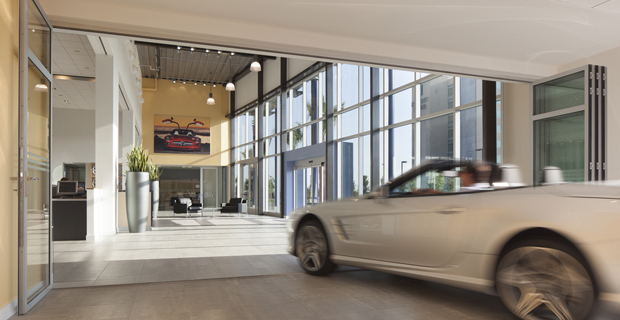 Dealership owners can leverage exterior glass walls systems to provide a stunning drive-off experience or easily swap out inventory as needed. With NanaWall solutions, the transition between interior and exterior is quick and seamless. 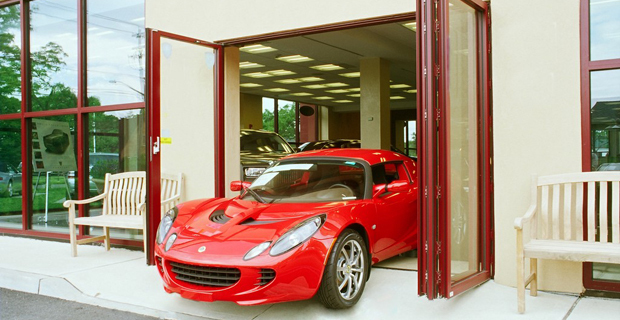 Our car showroom sliding doors are fully customizable, based on your needs and desires. NanaWall offers proprietary specifications for corporate branding, and our clients benefit from reduced costs on signature colors, logos and hardware styles. NanaWall products are independently tested for air, water, impact and thermal performance. Plus, our multi-point lock system meets or exceeds forced-entry testing for commercial-grade doors. Plus, built-in adjustment and compensation points ensure continued, in case the building settles on its foundation. Importantly, NanaWall will be your main point of contact for all service needs. NanaWall's dedicated support team is available to evaluate and assess your system as well as provide design guidance as needed. For real-world examples of how luxury car dealers across the globe use NanaWall solutions to enhance the showroom experience, see the case studies below. To solve the design challenges within this beautiful three story building, Vancouver based Cheng Architects turned to a NanaWall solution for this dealership’s inventory rotation. The project’s main focus was to design a dealership for high-end cars. But, a unique concept evolved to include a restaurant on the second floor with a viewing platform open to the showroom below. When designing a new auto showroom in Ontario CA, inventory access presented a unique challenge. As the architect discovered, there are few products which can provide a 9- to 12-foot clear width and still match the interior storefront design.